Prescription medications are one of the most common drugs that youth and adults are abusing every day in our country. The most commonly abused prescription medications are opioids and pain relievers (Codeine, Vicodin®, Norco®, OxyContin®), barbiturates and benzodiazepines (Valium®, Xanax®, Librium®), and stimulants (Adderall®, Concerta®, Ritalin®). Prescription medications are beneficial for a vast amount of health conditions, when used properly with instructions and supervision from a medical professional. When not used appropriately, they are being misused and abused at an alarming rate. 7% of high school students surveyed in Branch County have admitted to taking a prescription drug that wasn’t prescribed to them. 5.4 % of middle school students surveyed in Branch County have admitted to taking a prescription drug that wasn’t prescribed to them. They are prescribed by a doctor and made in a pharmaceutical lab. They must be safe, right? Many people misjudge their potential for harm and addiction. In addition, it is very important that you safeguard your medicine cabinets throughout your home. Know what medications you have and how much, so you will know if anything is missing. Teens who learn about the risks of drugs from their parents are 50 percent less likely to use drugs. So we ask you to take action, talk to your children and teens today about the risks of medicine abuse and overdose. We also ask that you safely dispose of your medicine into one of our Branch County Med Boxes. 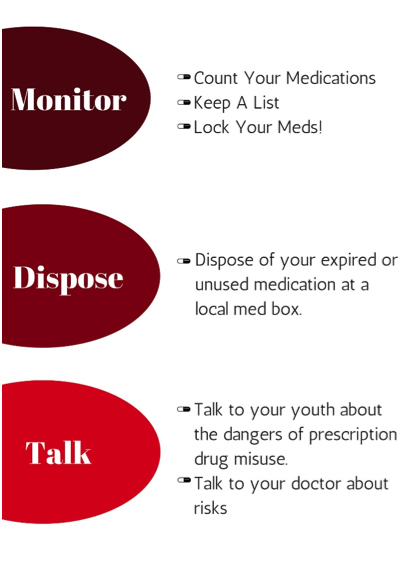 Follow these 3 steps to find out how to monitor your meds, dispose of unused or expired prescriptions and OTC medication in your home, and start having a conversation about the risks of prescription medications.